The popularity of fiberglass boats that began in the middle of the last century brought wooden boats – and the art of building them – to the brink of extinction. Kept alive through the passion of a small but fiercely dedicated band of owners, builders and restorers, boats crafted from trees are enjoying a remarkable renaissance. 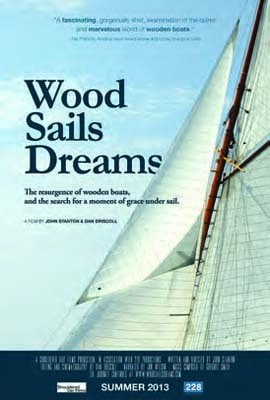 “WoodSailsDreams looks at the resurgence of the wooden boat culture over the last 40 years, from the rag tag regattas of the early 1970s to the beautifully restored classic yachts of today,” says producer John Stanton. Highlighted by gorgeous footage of wooden boats under sail by cinematographer Dan Driscoll, the film includes several insightful interviews, including boatbuilders Nat Benjamin, Ross Gannon, Steve White, Dan Shea and Bill Sauerbrey; Elizabeth Tiedemann, owner of the 12 Metre yachts Gleam and Northern Light; George Hill, owner of the 12 Metre Weatherly; Donald Tofias, founder of the W-Class Yacht Company; naval architect Halsey Herreshoff; Dyer Jones, CEO of the Herreshoff Marine Museum & America’s Cup Hall of Fame. WoodSailsDreams premiered at the 18th Annual Nantucket Film Festival with two sold out shows in June, it was selected as part of the Rhode Island International Film Festival in August, and the Jane Pickens Theater in Newport, RI hosted a special screening and panel discussion during the Newport International Boat Show. For more information about this superb film including the dates of future screenings, visit the WoodSailsDreams Facebook page.